The recipe states that these are just right for little hands and big appetites. They're also just right for big hands and little appetites (or big appetites) too. 1. Preheat oven 400º. Spray a shallow baking pan with vegetable oil. 2. Place crackers, basil, and pepper in a large plastic bag with a tight-fitting seal (leave end open so air can escape) and use a rolling pin to crush the crackers. Or place crackers, basil, and pepper in the work bowl of a food processor fitted with a metal blade and process until finely crushed; transfer to large plastic bag. Set aside. 3. Rinse chicken and pat dry. Cut into 16 strips, about 1x3 inches each. Dip chicken in milk. Add chicken strips, a few pieces at a time, to bag with cracker mixture. Seal bag and shake until chicken is coated. 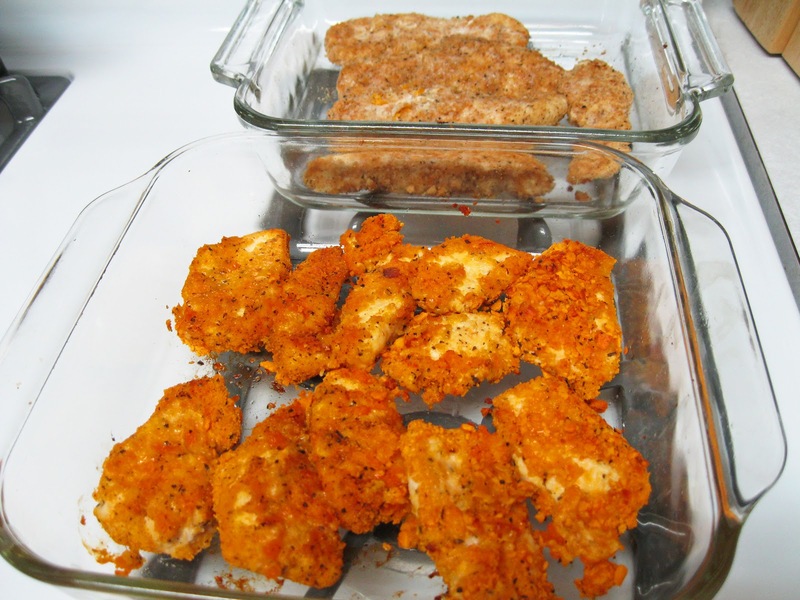 Place coated chicken in a single layer on prepared baking pan. 4. Bake, uncovered 5 to 7 minutes or until chicken is tender and no longer pink. Prepare recipe as above except cut chicken into bite-size pieces. Bake for 5 minutes or until tender and no longer pink. 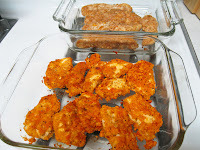 To add a little spice, sprinkle a little Tabasco and voilà you have a healthy version of buffalo chicken tenders. And for those who don't want cheese, you can either use Club crackers [chicken strips in the second dish] or Ritz crackers.